Next time you move into an old house, try this: water the garden. Even in yards long abandoned, living green things things start popping out of the ground (and no, Mr. Hockensmith, I’m not talking zombies). Plants that for years had been hiding in the dank, dark dirt decide to give it another go. Seemingly dead twigs might sprout new leaves; crumbly old bulbs take another shot at flowering; and how many times have I pronounced spiky old rosebushes dead-as-doornails just to have them prove me wrong the following spring, budding with a heavenly aroma rarely experienced with newer hybrids? The regenerative properties of plants are nothing short of…magical. Researching for my first witchcraft book, I came across the concept of a mandragora, a sort of household imp made from the root of a mandrake bush. 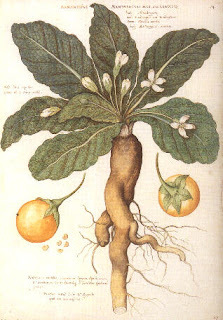 The mandrake bush, lore has it, emits a shriek so ear-piercing that it drives people mad when its roots are disturbed unless it is approached with respect, and paid with milk and bread and coins. 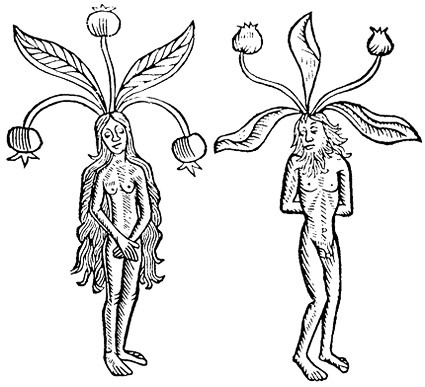 "Would you like to make a mandragora as powerful as the homunculus so praised by Paracelsus? Then find a root of the plant called mandrake. 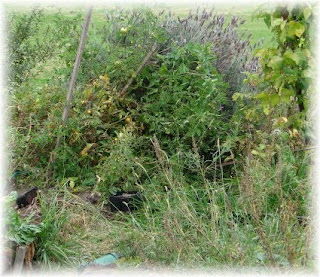 Take it out of the ground on a Monday (the day of the moon), a little time after the vernal equinox. Cut off the ends of the root and bury it at night in some country churchyard in a dead man’s grave. For thirty days water it with cow’s milk in which three bats have been drowned. When the thirty-first day arrives, take out the root in the middle of the night and dry it in an oven heated with branches of verbena. Then wrap it up in a piece of a dead man’s winding-sheet and carry it with you everywhere." "One thing about spells: Sometimes they have to be modified. Like any recipe, you make substitutions. You don’t have access to a dead man’s winding-sheet, you might use some gauze blessed with juniper and rose of Jericho instead. My blood would do instead of drowning the bats, and rather than actually burying the little guy in a dead man’s grave, all we needed was some freshly overturned cemetery dirt." Now, I know there are people who don't enjoy gardening, per se, but I ask you: what’s not fun about that? oh you, now i really really want to grow mandrake :) I love what you said about the dormant plants. I actually think we go through stages of our lives that are like that too, sometimes. When life has buffeted us about, we may have to use all our energy just to nurture the core, and so the outside may not be very encouraging for a while. but one day when the sun shines again - bam, god made us sturdy enough to pop right back out agin and thrive. You have my attention, Juliet! Lily has a way with words. Sophie, you grow the mandrake, and I'll help you yank out a root. 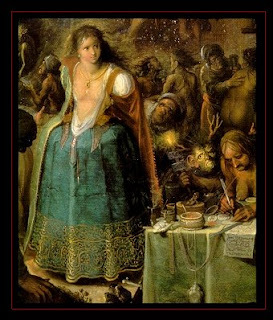 We both need a household imp, I think, don't you? I love that image of watering the "dead" garden and watching it come to life. Loved that passage from the book the first time I read it, thanks for reminding me. :) I want a yard like that! So, uh, by any chance, do these mandragora imps vacuum, dust and wash windows? That would be awesome.